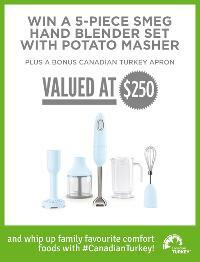 Prize: Prize consists of a 5-piece Smeg hand blender set as shown in the contest image, with a bonus Canadian Turkey apron, total value $250. Statistics: This contest was opened by 132 and entered by 30 ContestChest.com members. 23% of those who opened the contest, entered it.